After 30 years, finally this great period is covered in a decent way. Memories gives us the first sit-down show in its completeness. Including the Tiger Man release, we now have both sit-down shows in good sound quality. Of more value, however are the "out-takes" from June 29 - Stand Up shows. Great, new versions of Blue Suede Shoes, Jailhouse Rock, Don't Be Cruel and especially Love Me Tender. The latter is nothing less than magnificent!! Baby, What You Want Me To Do is great, I prefer this version of all we have. Good humour before Trouble/Guitar Man, and a cool, but short A Little Less Conversation. Also we have the complete Gospel Medley, ok to have, but I prefer the shortened version. Finally, some words about the promotion of this release. In August the Promo-release arrived. I guess we all know what the point with such a promo is. Does BMG?? Well, I'm not sure. The fact is that the promo contains a version of Jailhouse Rock (the already released version) that you will not find on Memories (or Tiger Man) !! Quite a scoop. Somebody in the department, wake up!! 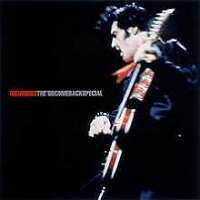 Besides that, Memories (especially disc 1) is already one of my favorite Elvis releases. Buy it! If you've never understood why Elvis mattered, one listen to this will set you straight. Leave it to RCA to finally release the best music of Elvis's career without any fanfare. Not only that, but instead of packaging the 1968 television special as its own set, they've inexplicably released it as two separate albums. Over the years, songs from the 1968 special have been released in dribs and drabs. Even this incomplete body of work has been enough for critics and fans to dub it Elvis's finest moment. Now, finally available in its entirety, this music proves every bit as essential as James Brown's Live at the Apollo 1962, Bob Dylan's Royal Albert Hall concert or any other great live album you care to name. If you've never understood why Elvis matters, one listen to this will set you straight. By 1968, Elvis was a joke and he knew it. The endless parade of mindless movies had taken their toll on his career. While the Beatles, Dylan, Black Panthers, student protests and Vietnam were turning the world inside out, Elvis was singing 'Yoga is as Yoga Does' and 'The Ballad of the Shrimp.' He wasn't just out of touch, he was practically an artifact. The Colonel (Tom Parker, Elvis's manager) conceived a Christmas television special as a way to resuscitate Elvis's sagging career. But instead of the schmaltzy production numbers the Colonel envisioned, Elvis sided with the producer, who wanted a stripped-down show, including segments of Elvis performing live for the first time in seven years. He knew it was now or never. Elvis taped two informal shows backed by his original band, guitarist Scotty Moore and drummer DJ Fontana. 'Informal' doesn't quite capture it: DJ used a guitar case as his drum, Elvis stopped some songs short, called for chorus after chorus of others, played Scotty's electric guitar while the band egged him on to dirty up 'Blue Christmas.' He told stories, cracked jokes, made fun of himself and ripped apart song after song. With his career on the line, Elvis threw everything he had into the music that night, and it's still shocking to hear just how much that was. On 'One Night' and 'Trying to Get to You,' Elvis summons depths of emotion only hinted at by his studio performances. Nowhere in his career is Elvis's sheer determination to realize his musical vision more apparent. For once you can feel him sweat as he pushes himself further, never taking his talent for granted. He tests the songs, seeing how much intensity they can handle. You can hear it in 'Love Me,' where the barely controlled violence in the way he sings "tear me all apart" leads directly into the tender, pleading chorus. But what mainly comes across is the pleasure Elvis and his band get from playing together. They transform 'Tiger Man' so that it's all rhythm and brag, playfully raunch up 'Lawdy Miss Clawdy.' The shows become celebrations, re-affirming Elvis's achievements only to surpass them. As for the product, start with Tiger Man, which contains the entire second show. But don't be surprised if before long you also need Memories, which collects both the first show and the medleys and choreographed numbers that rounded out the 1968 special. Songs overlap between the two informal shows, but the contexts are different enough that both deserve to be heard. You may also be pleasantly surprised by the quality of the formal numbers. While the medleys are too fragmented to be of any use, the rest is full of great moments and the occasionally overblown arrangements are saved by Elvis's inspired singing. A full band version of 'Jailhouse Rock' still retains its bite. 'Trouble' is played for all its dramatic impact, while 'If I Can Dream' is still a powerful closer, if a bit melodramatic. The only thing missing from these albums is the shock of actually seeing Elvis, tanned and trim, performing in black leather. Elvis can't stop his body from shaking with raw sexuality as he performs and the effect is spellbinding. At 35, there was still no one like him. F. Scott Fitzgerald is famously quoted as saying "There are no second acts in American life." But Elvis simply laughed that idea into oblivion. The 1968 special was truly a comeback, and it firmly cemented his relevance to rock 'n' roll. Elvis's second act lasted through a series of remarkable studio sessions in Memphis and his first dates in Las Vegas. But it was short-lived. Endless touring soon replaced the endless movies, and eventually the pills replaced everything else. You know the rest. As the '70s wore on, there were always hints that he might find his way back again -- a stirring performance here and there -- but they were only glimpses of what might have been but never was. The third act that Elvis needed so badly never came.